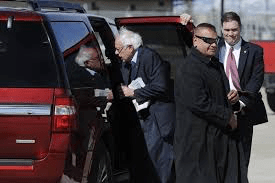 With a large Democratic 2020 Presidential field…The Trump admin asks for more money for the Secret Service…. This year there are LOT of people running on the Democratic side…. The number of them around after the first few primary state’s will drop dramatically…. But it still could be a good number…. President Donald Trump’s fiscal 2020 budget proposal seeks $2.3 billion to fund the U.S. Secret Service, an increase of 7 percent over the estimated spending for 2019 and some 15 percent above actual spending for 2018, according to budget documents released this week. The budget summary issued by the White House last week says it seeks to hire 177 additional special agents, officers, and professional staff for the agency. But the budget detail released this week says that overall Secret Service full-time equivalent employees will rise by 313 employees, jumping from 7,334 in the 2019 budget to 7,647 in the 2020 budget. That’s a four percent increase year over year, and a 10 percent increase over the 6,934 full time equivalent employees the service had in fiscal 2018. The Secret Service is responsible for protecting the president, vice president and their family members, as well as foreign leaders who are visiting the U.S. The agency is also responsible for investigating financial crimes and telecommunications fraud. Some $126.7 million extra in the budget will go for the 2020 presidential campaign, including the protection of major candidates, nominees, their spouses, and nominating conventions…..